India, with its young and educated workforce, supportive government initiatives, increasing foreign investments and robust entrepreneurial culture, is on its way to becoming a world-class economy. Combine this with a strong industry-academic engagement, and we should have an incredible springboard for turning into a global economic power. Today, India has the world’s largest ever populace of young people. More than half of the country – about 600 million people – is under 25 years old. No other country has more young people. More than 12 million youth between 15 and 29 years of age are expected to join the country’s labour force annually for the next two decades. The question is, will this youth be employable? To reap the dividends of its demographic potential, the country needs to skill, upskill and reskill its workforce with a focus on the changing nature of today’s jobs. Clearly, the dialogue needs to shift from quantity to quality of the country’s labour. There is a deep chasm between the actual workforce skills and skills expected on the job. More than 60 per cent of engineering graduates remain unemployed. Merely 7 per cent of engineering graduates is employable. A mere 11 per cent find jobs in knowledge-intensive sectors because their English skills are poor (74 per cent), as are their analytical or quantitative skills (58 per cent). This may be due to the lack of quality, skill-oriented education, the gap in teaching and learning pedagogy, insufficient infrastructure for developing skills and lack of syllabus upgrades among other factors. According to industry estimates less than 4 per cent of India’s population is trained. Organizations struggle with the low availability of appropriate skills. For example, according to a survey, 58 per cent of the 19 Indian financial services organizations experienced difficulties in recruiting the right people with the right skills. This is a major hurdle to the country fulfilling its superpower aspirations. How will this workforce match up as the world moves forward with advanced technologies like artificial intelligence, big data and cloud computing becoming mainstream skill sets? While we have retained the distinction as the most-preferred global outsourcing hub since the last two decades, a decisive factor is the availability of cheap labour in the country. However, it is often seen that global organizations prefer outsourcing the most basic aspects of their operations to India. The sophisticated front and middle-office operations are often retained within home countries or are outsourced to other nations which have a seemingly better and more skilled manpower. While labour is a key strength that we should leverage for our economic progress, we should also channelize efforts to grow the high-skill capabilities of our workforce. Only then can we shed our identity as the world’s back-office and strengthen our reputation as end-to-end partners of global growth. 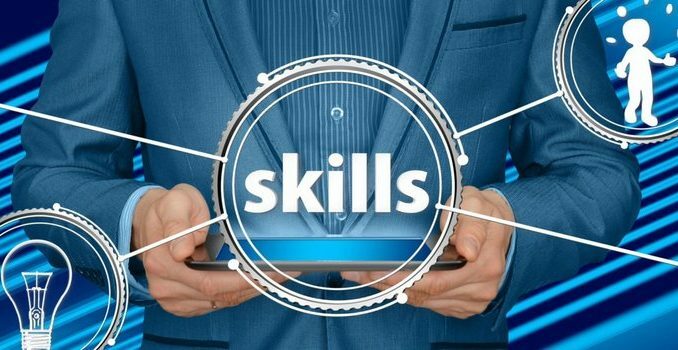 Further, as automation and artificial intelligence replace less-complex and low-skilled jobs, there is a need to renew our professional capabilities with sophisticated skills. Evidently, unlocking the potential opportunities requires investments and innovative approaches in higher education, industry-academia partnerships and technology training to upgrade the skills of our workforce. In 2015, Prime Minister Narendra Modi eloquently stated his objective of making “India the world’s human resource capital”. This vision has two-fold objectives: firstly, India’s workforce supply should adequately match its rapidly growing consumption demands. According to estimates, the 24 leading sectors of the economy will require an additional 110 million skilled personnel on an incremental basis. The major demands will arise from sectors such as retail, security, real estate, transport, beauty and wellness sectors. Secondly, India’s workforce should also be skilled enough to supplement the diminishing workforce in other countries. The median age of the world population is expected to touch 31 years by 2020. Japan will have among the world’s oldest population at 49 years, whereas the average age of Americans will hover around 45 years. The median age of China’s population is pegged around 37 years. In contrast, the median age of India’s population will be only 28 years. Both these opportunities illustrate that India’s next phase of growth will be rooted in the country’s human capital. The employment landscape of the country has witnessed a transformation over the last few decades. From being an agrarian nation India is fast evolving into the service-oriented economy. In 2007, ~54 per cent Indians were employed in the agriculture sector, whereas a ~26 per cent and ~21 per cent were engaged in the services and manufacturing sectors respectively. A decade later, the workforce distribution has changed radically. In 2017 ~43 per cent of the country’s labour force was engaged in agricultural pursuits while the numbers in services and manufacturing sectors had increased to ~33 per cent and ~24 per cent respectively. Policymakers are conscious of the enormous opportunities that are knocking at the country’s doors. Comprehensive policies are being drafted to enable the country to optimize growth prospects effectively. Skill development has been identified as a priority area in the national economic agenda. The result is the formulation of multiple schemes such as Skill India Mission, National Skill Development Mission, Deen Dayal Upadhyay Gram Kaushal Yojana, Pradhan Mantri Kaushal Vikas Yojana etc. These schemes are directed at different target audiences and skills. However, the common factor is that they aim to provide the essential linkage between the industry and the youth through upskilling. While the various skill development policies are steps on the right track, India needs more efforts in this direction. The outreach of such programmes has to reach to the remotest corners of the country and benefit the most marginalized members of the society. For instance, the business process outsourcing sector is largely affected by automation technologies. However, contrary to the common misconception of its manpower requirements being replaced by artificial intelligence and bots, the sector will continue to be a net job creator. Studies estimate that the industry will hire up to 2.5 to 3 million more workers over the next seven years i.e. until 2025. However, the key is that they should acquire the necessary skills to meet the changing needs of the industry. There is a significant employability gap in India, and this gap needs to be bridged with skilling, upskilling and reskilling for us to realize our global economic power dream. Industry-academia partnership in providing training and ensuring employability of our workforce is the key. On one hand, technology is rewriting the rules of employment. On the other, the democratization of technology is improving student access and outcomes. The education sector must accelerate its efforts to attune itself to the changing technological requirements and equip the workforce with the required skills to be competitive and employable. Organizations too need to provide opportunities for students to gain real-world learning experiences. And then we may find that achieving the dream of becoming a global economic power is well within our reach.